Dhaval Yours: What is magic behind 5 second websites ? Avani(My sis) :: So Dha Whts new ?, Whts your new project ? Dhavalyours :: Castrol Cricket visit the website and tell me how it is ? Avani(My sis) :: Its still loading Dhaval. dont worry i will check it out later. Dhavalyours :: Di it should load by this time. Avani(My sis) :: I have 'dial up connection' remember and if u think u are smart .... make your website Google Fast, Why does not your site load in less than 5 secs ??? That's when the entire idea of 5 Second websites idea kicked in. I dived into my teams production cycle. It looked something like below graph.Lemme say you one thing, i work in a digital agency, We code mostly in RAD (Rapid Application Development.) model. So your company working process model may differ, but below is how we used to work. In this entire process of changes->development->changes, the factor of High Performance Websites is almost been lost or ignored. Due to unanticipated changes in the work flow, Code becomes more and more buggier and complex. But hey our topic is not web development its fast websites. As Per the Yahoo 19 High performance website rules , i would state only major and that helped me a lot to actually make a 5 second website as in state it is today. (Do not know when creative changes the entire design :) ) http://www.xoassembly.com/ For actually putting into practice the High Performance Rules, traditional way of product making should change. 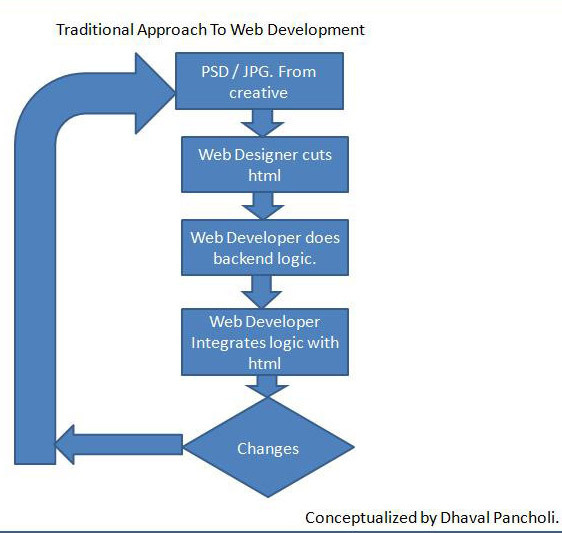 Work Flow Of developing high performance websites. 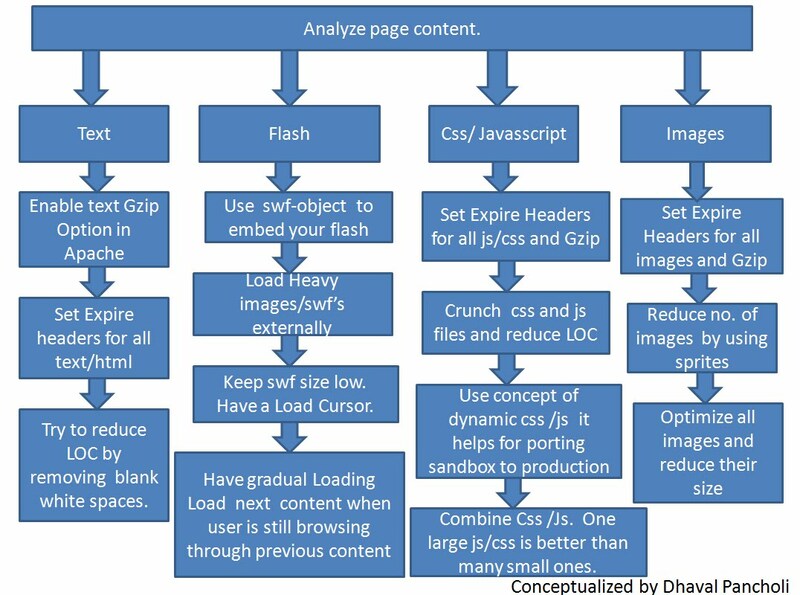 Now before developing all the content appearing in the page has to be analyzed thoroughly by web dev and web designer. Its not an independent task , Its a collaborative task. Different content needs to be taken care of in a different way so that it is been optimized for web. 1) Configure your Server ( little pain but trust me it helps a lot.) Following settings i recommend. 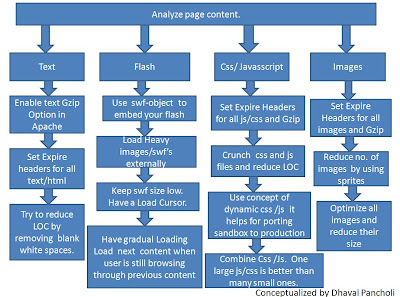 ii) Caching headers for text, image, js, css,flash. 2) Use YSlow : YSlow is a plugin that comes with FireFox. It needs Firebug to be installed. YSlow grades your website depending on several yahoo High Performance rules parameters. If you get rating of above 90 in YSlow you are doing really really good. I know it is not possible to be above merit list in all pages but try hard not to get below 85. YSlow gives you tips and grade to what part of the page you need to improve to make your page load faster. if you request content like www.xyz.com/1.jpg cookie is been sent along with your request header. loading of a.css and b.css would start simultaneously. 2) High Performance Website Rules with Examples. 4) Yahoo High Performance Rules. PageSpeed tu bol raha hai firebug ka plugin hai..toh is it client side software? If it is client side how can it affect ur website speed?! @Yatin You got it all wrong. Page Speed and Yslow are not performance enhancement tools, They are performance measure tools. All performance enhancement has to be taken care of server side only. Yslow,Pagespeed Give ranking to every website based on various factors such as number of images loaded, simultaneous download of js files, using cdn, your server configuration. They help us analyze our webpage and also give u s tips on how to improve it. Now PageSpeed analyzes page content and on the fly on the client side generates compressed version of js / images for you. So PageSpeed provides security by not revealing the website js and css....it has nothing to do with improving speed of the web site??!!! Interesting. So do you really code HTML? Cos that is a lot of pain when it comes to designing some "cool" websites. From what I know you always give a site the 5 second load time by not putting everything on the home page. You only put the required information! If you have too many images and too much data, it not only clutters the space, but also increases the load time. When users use browsers like Firefox or IE, most of the data is cached, and the non changing data does not require a fresh load.. So which means, the site load time drastically comes down the second time and further..
Hi Kunal, Welcome here, No i don't code html in fact i m a web application developer, the back-end guy who has to do the dirty work of site integration :)No i don't get the privilege of web design i get the design from creative team and have to work on it and YES we can have faster web pages and heavy UI. Take Yahoo home page for reference. I love yahoo they experiment a lot with their home page and still manage to be in 5 second website list. Yes Loading does also varies depending on various browsers. But until and unless you write code in your server to cache the page any browser doesn't cache it completely. And Yeah any time we can have long tech talks you already know me on Facebook. Just Drop in a Topic and we will have a healthy conversation. The title says it all "Raw Optimization Report Without Any BS".